The traditional way to monitor replication in MySQL is the SHOW SLAVE STATUS command. However as it will be shown, it has its limitations and in MySQL 5.7 and 8.0 the MySQL developers have started to implement the information as Performance Schema tables. This has several advantages including better monitoring of the replication delay in MySQL 8.0. This blog discusses why SHOW SLAVE STATUS should be replaced with the Performance Schema tables. The replication setup that will be used for the examples in this blog can be seen in the following figure. There are two source instances (replication masters). Source 1 replicates to the Relay instance (i.e. it acts both as a replica and source in the setup). The Relay instance replicates to the Replica instance which also replicates from Source 2. That is, the Replica instance uses multi-source replication to replicate from the Source 1 → Relay chain as well as directly from Source 2. This blog will use the Replica instance to demonstrate SHOW SLAVE STATUS and Performance Schema replication tables. The SHOW SLAVE STATUS command has been around since the addition of replication to MySQL. Thus it is familiar to all database administrators who have been working with replication. It is also very simple to use, and it is easy to remember the syntax. So far so good. However, it also has some limitations. There is no support for filter conditions or choosing which columns to include, so the output is very verbose. In this case with two replication channels, all available data for both channels are always included. The order of the columns reflects the order they were added rather than how they logically belong together. Over the years many new columns have been added as new features have been added or the feature has been changed from an option configured in my.cnf to an option configured with CHANGE MASTER TO. For example the channel name is the fourth column from the end even if it would be more natural to have it as the first column (as it’s it the “primary key” of the output). For multi-threaded appliers (replication_slave_workers > 1) there is no information for the individual workers. Information related to the connection (I/O thread) and applier (SQL thread) as well configuration and status are mixed. What does Seconds_behind_master mean? For the source_2 channel (the direct replication from Source 2 it is relatively easy to understand, but for the relay channel is it relative to Source 1 (yes) or to Replica (no)? More about this later. To look at what can be done to solve these limitations, let’s look at the Performance Schema. To overcome these limitations, MySQL 5.7 introduced a series of replication tables in the Performance Schema. These have been extended in MySQL 8.0 to make them even more useful. One of the advantages of using the Performance Schema is that queries are executed as regular SELECT statements with the usual support for choosing columns and manipulating them and to apply a WHERE clause. First, let’s take a look at which replication related tables that are available. log_status: This table is new in MySQL 8 and provides information about the binary log, relay log, and InnoDB redo log in a consistent manner (i.e. all values are for the same point in time). replication_applier_configuration: This table shows the configuration of the applier threads for each replication channel. Currently the only setting is the configured replication delay. replication_applier_filters: The channel specific replication filters including where and when they were configured. replication_applier_global_filters: The global replication filters including how and when they were configured. replication_applier_status: This table shows the replication filters for each replication channel. The information includes the service state, remaining delay, and number of transaction retries. replication_applier_status_by_coordinator: For multi-threaded replicas this table shows the status of the thread that manages the actual worker threads. In MySQL 8 this includes several timestamps to give detailed knowledge of the replication delay. replication_applier_status_by_worker: The status of each worker thread (for single-threaded replication there is one per channel). In MySQL 8 this includes several timestamps to give detailed knowledge of the replication delay. In MySQL 8.0.13 and later it also includes detailed information about transient errors (see Extending replication instrumentation: an insight on transaction retries in the MySQL High Availability Blog). replication_connection_configuration: The configuration of each of the replication channels. replication_connection_status: The status of the replication channels. In MySQL 8 this includes information about the timestamps showing when the currently queuing transaction was originally committed, when it was committed on the immediate source instance, and when it was written to the relay log. This makes it possible to describe much more accurately what the replication delay is. replication_group_member_stats: Shows statistical information for Group Replication members. replication_group_members: Information about the members of a Group Replication (or InnoDB Cluster) setup. The Group Replication tables will not be discussed further. Since the information from SHOW SLAVE STATUS has been split up into several tables, it can be useful to take a look at how the information map. The following table shows how to get from a column in the SHOW SLAVE STATUS output to a table and column in the Performance Schema. The channel name is present in all of the Performance Schema replication tables (it’s the primary key or part of it). The replication filters and rewrite rules are split into two tables. The I/O and SQL thread states can be found in the performance_schema.threads by joining using the THREAD_ID column for the corresponding threads. As it can be seen, there are a few columns from SHOW SLAVE STATUS that do not have any corresponding tables and columns in the Performance Schema yet. One that probably is familiar to many as the main mean of monitoring the replication lag is the the Seconds_Behind_Master column. This is no longer needed. It is now possible to get a better value using the timestamp columns in the replication_applier_status_by_coordinator, replication_applier_status_by_worker, and replication_connection_status tables. Talking about that, it is time to see the Performance Schema replication tables in action. The rest of the blog shows example outputs each of the replication tables (except the ones related to Group Replication) in the Performance Schema. For some of the tables there is a short discussion following the output. The queries have been executed in rapid succession after the above SHOW SLAVE STATUS output was generated. As the outputs have been generated using separate queries, they do not correspond to the exact same point in time. There is one filter specifically for the relay channel: the channel will ignore changes to tables in the world schema and the filter was set using the the replicate_wild_ignore_table option in the MySQL configuration file. There is also one global replication filter. This has been set using the CHANGE REPLICATION FILTER statement. This is an example of MySQL 8 has detailed information about the timings were for the various stages of the applied events. For example for the relay channel, it can be seen that for the last processed transaction, it took 18 seconds from the transaction was committed on Source 1 (original commit) until it was committed on Relay (immediate commit), but then it only took around half a second until the coordinate was done processing the transaction (i.e. sending it to a worker). Which brings us to the status by worker. The timestamps for the relay channel’s workers (only one has been active as it can be seen) can be used to see that the last transaction took around 19 seconds to apply and it was committed also 19 seconds after it committed on the immediate source (the Relay instance). You can compare this delay of 19 seconds with the 49 seconds claimed by Seconds_Behind_Master in the SHOW SLAVE STATUS output. Why the difference? Seconds_Behind_Master is really the time from the original source started to execute the current transaction until now. So that includes the time it took to execute the transaction not only on Source 1 but also on Relay and the time used until now on Replica. Similar to the applier timestamps, the connection timestamps can be used to check the lag caused by the connection threads fetching the transactions from its source’s binary log and writing it to its own relay log. For the relay channel it took around 0.14 second from the transaction was committed on the immediate source (the Relay instance) until the connection thread started to write the transaction to the relay log (LAST_QUEUED_TRANSACTION_START_QUEUE_TIMESTAMP) and then further 0.007 second to complete the write. The replication related tables in the Performance Schema, particularly the MySQL 8 version of them, provides a very useful way to get information about the replication configuration and status. As a support engineer myself, I look forward to have access to the new timestamp values, when I investigate replication delays. There is still some work remaining such. For example, it could be useful to know when the transaction started on the original source. That way it is possible to compare the execution time between a source and a replica. However, the current information that is available is already a great improvement. MySQL has since version 5.7 had support for progress information for some queries. As promised in my previous post, I will here discuss how you can use that to get progress information for ALTER TABLE on InnoDB tables. This also shows how the setup_instruments table in MySQL 8 has some additional information about the instruments such as properties and documentation (not included in the output). Adding this information is still work in progress. MySQL 5.7 does not provide as easy a way to obtain the instruments providing progress information. Instead you need to consult the reference manual. However, the principle in using the feature is the same. Since the consumers form a hierarchical system, the sys schema function ps_is_consumer_enabled() is used to show whether the consumer is enabled taking the whole hierarchy into consideration. That is it. Now you can monitor the progress of the queries that uses the stages with progress information. The more parts of the Performance Schema that is enabled and the more fine grained monitoring, the more overhead. Stages are not the worst with respect to overhead; nevertheless it is recommended you keep an eye on the affect of enabling the events_stages_current consumer. WORK_COMPLETED: The amount of work that is reported to have been completed. WORK_ESTIMATED: The estimated amount of work that needs to be done. For InnoDB ALTER TABLE the estimated amount of work is for the entire operation. That said, the estimate may be revised during the process, so it may happen that the if you calculate the percentage it decreases as time goes. However, in general the percentage (100% * WORK_COMPLETED/WORK_ESTIMATED) will increase steadily until the operation completes at 100%. For now, let’s look at an example. There is another way though. Instead of using the performance_schema.events_stages_current table directly, an easier way is to use the sys.session view. This is an advanced process list that includes much more information than the usual SHOW PROCESSLIST statement including progress information. The performance of sys.session has been improved with more than an order of magnitude in MySQL 8 by the addition of indexes to the Performance Schema tables making it highly useful. In the example, the @sys.statement_truncate_len user variable is set to 85. By default the sys schema ensures the current statement is at most 64 characters long. In order to avoid truncation in this case, the truncate length is increased to 85. The example output shows that the progress is at around 49%. It is important to note that is an estimate and not an exact number. The ALTER TABLE is performing a merge sort at the time, and the query has been running for 4.22 seconds. A couple of other interesting columns are included. It can be seen the connection is using 464KiB at the time. In MySQL 8 memory instrumentation is enabled by default (in MySQL 5.7 you need to enable it yourself). Additionally, the name of the program executing the query is MySQLWorkbench, that is the query originates from MySQL Workbench. So, next time you plan a large ALTER TABLE operation, consider enabling the events_stages_current consumer, so you can follow the progress. What Does I/O Latencies and Bytes Mean in the Performance and sys Schemas? The Performance Schema and sys schema are great for investigating what is going on in MySQL including investigating performance issues. In my work in MySQL Support, I have a several times heard questions whether a peak in the InnoDB Data File I/O – Latency graph in MySQL Enterprise Monitor (MEM) or some values from the corresponding tables and view in the Performance Schema and sys schema are cause for concern. This blog will discuss what these observations means and how to use them. events_waits_summary_global_by_event_name: with the event name set to wait/io/table/sql/handler or wait/io/file/%. This is the table used for the waits_global_by_latency and wait_classes_global_by_% views in the sys schema. table_io_waits_summary_by_table: this is the table used for the schema_table_statistics% views in the sys schema. file_summary_by_instance: this is the table used for the io_global_by_file_by% views in the sys schema. These are also the sources used in MySQL Enterprise Monitor for the InnoDB Data File I/O graphs shown above. Let’s take a look at an example of each of the tables. These three queries show the same data, just obtained and displayed in different ways. In the result there are two groups of events. The wait/io/table events (the wait/io/table/sql/handler is the only event of this group which is why it can be listed explicitly) and the wait/io/file group. The table events are for accessing data in tables. It does not matter whether the data is cached in the buffer pool or is accessed on disk. In this table and view, there is no distinguishing between different types of access (read, write, etc.). The file events are, as the name suggest, for actually accessing files. There is one file event per file type. For example, in he output there are the wait/io/file/innodb/innodb_log_file event for accessing the InnoDB redo log files, the wait/io/file/innodb/innodb_data_file event for accessing the InnoDB data files themselves, the wait/io/file/sql/binlog event for the binary log files, etc. In the second query, all of the timings are wrapped in the sys.format_time() function. The timings returned by the Performance Schema are in picoseconds (10^-12 second) which are somewhat hard for us humans to read. The sys.format_time() function converts the picoseconds to human readable strings. When you sort, however, make sure you sort by the original non-converted values. Use the sys.format_time() function to convert the picoseconds to a human readable value, but do only so for the returned row; sort and filter by the original values. The Performance Schema always returns timings in picoseconds irrespective of the timer used internally for the event. The sys schema by default returns the timing as human readable values. If you need the values in picoseconds prefix the table name with x$, for example sys.x$waits_global_by_latency. The sys schema includes an ORDER BY clause in most views. For the waits_global_by_latency view, the default ordering is by the total latency, so there is no need to add an ORDER BY clause in this example. The table_io_waits_summary_by_table Performance Schema table and schema_table_statistics% sys schema views are related to the wait/io/table/sql/handler event just discussed. These provide information about the amount of time spent per table. Unlike querying the wait/io/table/sql/handler in the wait_events_% tables, it split the time spent into whether it is used for reads, writes, fetch, insert, update, or delete. The read and write columns are the aggregates for the corresponding read and write operations, respectively. Since fetch is the only read operation, the read and fetch columns will have the same values. In this case it shows that there has been mostly writes – inserts – for the table. The sys schema view effectively joins on the performance_schema.file_summary_by_instance for the read columns, so for the schema_table_statistics view fetch and read are not synonyms. So, what is it the file_summary_by_instance table shows that is different table the “table I/O” that has been the topic of the first two tables? Let’s see. Unlike the two previous tables, the file_summary_by_instance shows how much time is spent on actual file I/O and how much data is accessed. This makes the file_summary_by_instance table and the corresponding sys schema views very useful for determining where time is spent doing disk I/O and which files have the most data accesses on disk. This example is from Microsoft Windows, and as always when backslashes are in play, it is fun to try to determine the appropriate number of backslashes to use. When specifying the file name with LIKE, you need four backslashes per backslash in the file name; when using = you need two backslashes. Again, the values are split into reads and writes (though not as detailed as before with fetch, insert, update, and delete – that is not known at the level where the file I/O happens). The miscellaneous values include everything that is not considered reads or write; this includes opening and closing the file. The sys schema queries not only have formatted the timings, but also the path and the bytes. This has been done using the sys.format_path() and sys.format_bytes() functions, respectively. From the output, it can be seen that despite no rows were ever fetched (read) from the employees.salaries table (that was found in the previous output), there has still been some read file I/O. This was what the sys.schema_table_statistics view reflected. So, what does all of this mean? The graph in MySQL Enterprise Monitor showed that there was six seconds file I/O latency for the InnoDB data files. Is that bad? As often with these kinds of questions, the answer is: “it depends”. In this case we have a case where the graphs in MySQL Enterprise Monitor show a peak for the latency and bytes used doing I/O on the InnoDB data files. This is actually disk I/O. But what exactly does that means and should the alarm sound? If you are not using MySQL Enterprise Monitor, you may have similar graphs from your monitoring solution, or you have obtained latency and bytes values from the tables and views discussed in this blog. The latency graph shows that we have done six seconds if I/O. What does that mean? It is the aggregate I/O during the period the data was collected. In this case, the data is plotted for every minute, so in the one minute around 12:51, of the 60 seconds a total of six seconds was spent doing I/O. Now, the six seconds suddenly do no sound so bad. Similar for the bytes, around 4.6MiB of data was read or written. In general, the values obtained either from the monitoring graphs or from the underlying tables cannot be used to conclude whether the is a problem or not. They just show how much I/O was done at different times. Similar for the values from the Performance Schema. On their own they do not tell much. You can almost say they are too neutral – they just state how much work was done, not whether it was too much or too little. A more useful way to use this data is in case a problem is reported. This can be that system administrator reports the disks are 100% utilized or that end users report the system is slow. Then, you can go and look at what happened. If the disk I/O was unusually high at that point in time, then that is likely related, and you can continue your investigation from there. The MySQL Workbench performance reports also allows you to export the report or copy the query used to generate the report, so you can execute it manually. With respect to the wait/io/table/sql/handler events, then remember that I/O here does not mean disk I/O, but table I/O. So, all it means that time is accumulating for these events – including when looking at the per table is that the data in the table is used. There are also per index values in table_io_waits_summary_by_index_usage Performance Schema table and the schema_index_statistics sys view which have the same meaning. Whether a given usage is too high depends on many things. However, it can again be useful to investigate what is causing problems. For the example data from this blog, it was triggered by loading the employees sample database. So, there was no problem. If you want to put data into your database, it must necessarily be written to the data file, otherwise it will not be persisted. However, if you think the data import took too long, you can use the data as part of your investigation on how to make the import faster. The conclusion is that you should not panic if you see the I/O latencies peak. On their own they just mean that more work was done during that period that usual. Without context a peak is no worse than a dip (which could indicate something is preventing work from being done or that there is a natural slow period). Instead use the I/O latencies and bytes together with other observations to understand where MySQL is spending time and for which files data is being read and written. The GitHub repository for the sys schema includes all the definitions of the views (and other objects). Since these are written in plain SQL, they are very useful to see in more depth where the data is coming from. The GitHub website allows you to browse through each of the files. Each sys schema object is defined in its own file. Sometimes it can be useful to take a step back and look at the world from a bit larger distance than usual. So in this blog, I will take a look at the high level architecture of MySQL Server. This is meant as a simplified overview and does not include all details. For the discussion I will be referring to the the following figure that shows some of the features and plugins of MySQL. Orange boxes are available both for the community version and the commercial (enterprise) version, whereas red means the plugin is exclusive for the commercial version. Ellipsoid elements are plugins, whereas square (yes with round corners) elements indicate other features. The figure is based on MySQL 5.7.20 where the audit log can be used to block access to tables. At the top there are the various connectors and APIs that can be used in the application to connect to MySQL. As the mysql command-line client uses the C API, this is included in this part of the figure as well. There are more connectors and APIs than I could fit into the figure; for the complete list see the documentation index. The large darkish box represents the server. At the top there is the connection handling where there are two choices: use one thread per connection or use the commercial thread pool plugin. One thread per connection is the original way of handling new connections and as the name implies, it is simply creating a new thread for each new connection. The MySQL Enterprise Thread Pool will limit the overall number of threads by re-using the threads. This leads to better scalability particularly in the case of many connections executing short queries. After the initial thread handling, it is possible to send the connection through the optional Connection-Control plugin which will throttle the connections for an account, when there are multiple attempts to login with the wrong password. Once the connection has been cleared to move ahead, the query is checked against the Query Cache if it is a SELECT statement, and the Query Cache is enabled. For most workloads the Query Cache will be an overhead that does not justify the potential gain. So, in practice it is recommended to completely disable it. The Query Cache has been deprecated and is removed in MySQL 8.0.3 and later. This assumes the Query Rewrite plugin has already been installed. It is not until now that the query actual reaches the parser (this will not happen if the query has a match in the Query Cache). After the parser has processed the query, it is known which schemas, tables, columns, etc. that will be required to answer the query, which means it is also possible to verify whether the user is allowed to use these objects. After the parser, the MySQL Enterprise Firewall will be invoked if it is installed and enabled. The firewall compares the query’s digest to a whitelist of digests and if the query is in the whitelist. If the query is not in the whitelist it can be recorded or blocked (depending on configuration). The last plugin is the MySQL Enterprise Audit plugin. In MySQL 5.7.20 and later, the audit log can be used to block access to a schema or a table in addition to log the access. This is the time where the plugin checks whether the access is allowed. Finally the optimizer will determine the query plan and the query will be executed. The query execution will in almost all cases involve requesting data from or sending data to one of the storage engines. 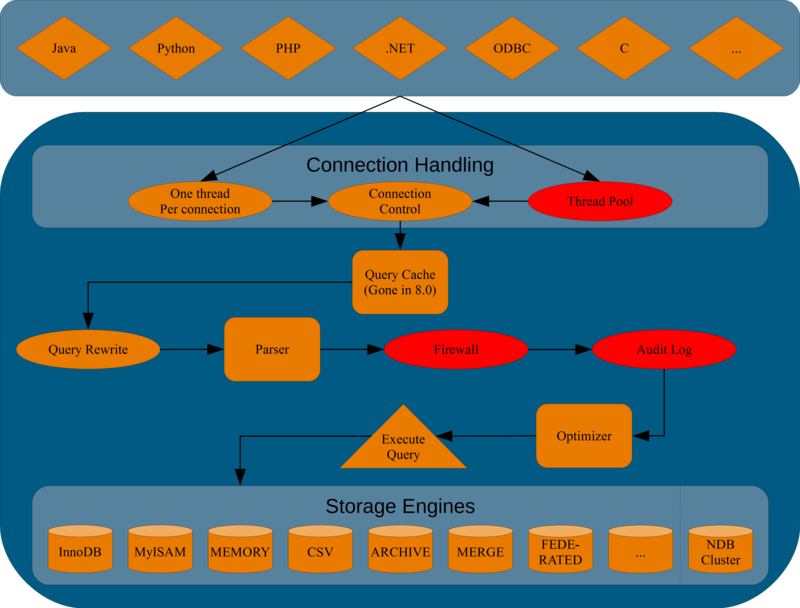 MySQL supports several storage engines through the pluggable storage engine architecture. Nowadays, the main storage engine is InnoDB, but several others exists including the NDBCluster storage engine that is used in MySQL NDB Cluster to execute queries through the SQL nodes (MySQL Server instances). This assumes the two connections use different usernames. If that is not the case, then you will need to adjust the above query. InnoDB Locks Analysis: Why is Blocking Query NULL and How To Find More Information About the Blocking Transaction? This post was originally published on the MySQL Support Team Blog at https://blogs.oracle.com/mysqlsupport/entry/innodb_locks_analysis_why_is on 14 April 2017. You continue to investigate the issue using the sys.innodb_lock_waits view or the underlying Information Schema tables (INNODB_TRX, INNODB_LOCKS and INNODB_LOCK_WAITS). The above Information Schema tables with lock and lock waits information have been moved to the Performance Schema in 8.0 as the data_locks and data_lock_waits tables. The sys schema view however works the same. However, when you query the locks information, the blocking query is returned as NULL. What does that mean and how to proceed from that to get information about the blocking transaction? and will be removed in a future release. The warnings will only occur in the 5.7.14 and later as the InnoDB lock tables being moved to the Performance Schema in MySQL 8.0. It is recommended to use the sys.innodb_lock_waits view as that is updated accordingly in MySQL 8.0. For the following queries insert the thread id found above for the THREAD_ID = … where clauses. So now the history of the blocking transaction can be seen and it is possible to determine why the locking issue occur. The history also includes some queries executed before the transaction started. These are not related to the locking issue. This must be done before either of the transactions is started. Only transaction started after the transaction monitoring is enabled will be instrumented. In MySQL 5.5 metadata locks were introduced to ensure consistency for some operations that previously could cause problems. For example if a transaction SELECTed from a table and another connection changed the structure of the table before the transaction was committed; in that case the two operations would be written in reverse order to the binary log which could prevent replaying the binary log. In this case it happens to be the process with Id = 3 that holds the metadata lock, but that is not obvious from the above output. In MySQL 5.7.3 this has changed. There is a new Performance Schema table metadata_locks which will tell which metadata locks are held and which are pending. This can be used to answer the question for a case like the one above. First instrumentation of metadata locks should be enabled. To do that you must enable the wait/lock/metadata/sql/mdl instrument in setup_instruments. Additionally the global_instrumentation consumer must be enabled in setup_consumers. Currently the wait/lock/metadata/sql/mdl instrument is not enabled by default. I have created a feature request to consider enabling it by default, but obviously whether that will happen also depends on the performance impact. Update: The instrument is enabled by default in MySQL 8.0. The global_instrumentation consumer is enabled by default. So in this case there is a metadata lock GRANTED to process list id 3 whereas the other connections have a PENDING lock status for the metadata lock for the City table. During my talk and hands on labs at MySQL Connect 2013 I used several views, functions, and procedures from ps_helper and ps_tools. The slides from the two talks can be downloaded from Thanks For Attending MySQL Connect or from the MySQL Connect 2013 Content Catalogue. You can read more about ps_helper on Mark Leith’s blog and you can download ps_helper from github. To get ps_tools, download ps_tools.tgz from here. Once unpacked there is a ps_tools_5x.sql for each of the versions supported. The tools presented at MySQL Connect were all based on MySQL 5.6 and 5.7. Note that several of the included tools are not particularly useful on their own but are more meant as utility functions for some of the other tools. The actual implementations are organised so they are in the subdirectory corresponding to the earliest version it applies to. For a few tools, such as ps_reset_setup(), there are multiple versions depending on the MySQL version it applies to. Several of the tools have a help text at the top of the source file. Similar to performance_schema.setup_consumers, but includes a column to display whether the consumer is effectively enabled. See also slide 10 from CON 5282. See also A Couple of Substring Functions: substr_count() and substr_by_delim(). Lists each account and whether it is enabled according to performance_schema.setup_actors. Creates a tree displaying whether instruments are enabled. See Easier Overview of Current Performance Schema Setting for more details. Creates a tree displaying whether instruments are enabled. See Easier Overview of Current Performance Schema Setting and slide 11 from CON 5282 for more details. This is the same as in ps_helper with one bug fix. See also slides 30-31 from CON 5282. Enable all consumers and instruments. Reset consumers, instruments, actors, and threads to the defaults (without taking my.cnf into consideration). Show information about waiting locks for InnoDB. Summary of the amount of data and indexes grouped by storage engine. The amount of memory used grouped by thread and event without any formatting and ordering. The same as above but formatted output and ordered by current usage. The same as above but formatted output and ordered by the high watermark. Lists unused stored procedures and functions. MySQL Connect 2013 was held this past Saturday through Monday, and I would like to extend a big thank you to everyone who attended my sessions, I talked to or otherwise took part in the conference. This is the workbook from the Hands On Lab which includes the instructions used during the lab. The queries that are started in the second part when queries are investigated are just arbitrary queries meant to generate some background workload that will show up when looking in the Performance Schema tables and the views from ps_helper and ps_tools. Any workload should work fine. For ps_tools, I will follow up on this site with more information although some of the tools can be found in Easier Overview of Current Performance Schema Setting. Note: the presentation uses the naming convention that Performance Schema tools are prefixed ps_ – that was not the case in the above blog, so e.g. ps_setup_tree_consumers is in the blog called setup_tree_consumers. And again: thanks for attending MySQL Connect 2013 – hope to see you again next year. While I prepared for my Hands-On Lab about the Performance Schema at MySQL Connect last year, one of the things that occurred to me was how difficult it was quickly getting an overview of which consumers, instruments, actors, etc. are actually enabled. For the consumers things are made more complicated as the effective setting also depends on parents in the hierarchy. So my thought was: “How difficult can it be to write a stored procedure that outputs a tree of the hierarchies.” Well, simple enough in principle, but trying to be general ended up making it into a lengthy project and as it was a hobby project, it often ended up being put aside for more urgent tasks. However here around eight months later, it is starting to shape up. While there definitely still is work to be done, e.g. creating the full tree and outputting it in text mode (more on modes later) takes around one minute on my test system – granted I am using a standard laptop and MySQL is running in a VM, so it is nothing sophisticated. The current routines can be found in ps_tools.sql.gz – it may later be merged into Mark Leith’s ps_helper to try to keep the Performance Schema tools collected in one place. setup_consumers – Displays whether each consumer is enabled and whether the consumer actually will be collected based on the hierarchy rules described in Pre-Filtering by Consumer in the Reference Manual. accounts_enabled – Displays whether each account defined in the mysql.user table has instrumentation enabled based on the rows in performance_schema.setup_actors. color is whether to add bash color escapes sequences around the consumer names when used a Text format (ignored for Dot outputs). color is whether to add bash color escapes sequences around the instrument names when used a Text format (ignored for Dot outputs). type – whether to base the tree on the ENABLED or TIMED column of setup_instruments. only_enabled – if TRUE only the enabled instruments are included. regex_filter – if set to a non-empty string only instruments that match the regex will be included. color is whether to add bash color escape sequences around the names when used a Text format (ignored for Dot outputs). is_consumer_enabled(consumer_name) – Returns whether a given consumer is effectively enabled. is_account_enabled(host, user) – Returns whether a given account (host, user) is enabled according to setup_actors. substr_count(haystack, needle, offset, length) – The number of times a given substring occurs in a string. A port of the PHP function of the same name. substr_by_delim(set, delimiter, pos) – Returns the Nth element from a delimiter string. The two functions substr_count() and substr_by_delim() was also described in an earlier blog. The formats for the four stored procedures consists of two parts: whether it is Text or Dot and the direction. Text is a tree that can be viewed directly either in the mysql command line client (coloured output not supported) or the shell (colours supported for bash). Dot will output a DOT graph file in the same way as dump_thread_stack() in ps_helper. The direction is as defined in the DOT language, so e.g. Left-Right will have the first level furthest to the left, then add each new level to the right of the parent level. As the source code – including comments – is more than 1600 lines, I will not discuss it here, but rather go through some examples. Here a small part of the tree is selected using a regex. The full output is rather large (6.7M). If you want to see if you can get to it at http://mysql.wisborg.dk/wp-content/uploads/2013/05/setup_tree_instruments_dot_lr.png. There is definitely more work to do on making the Performance Schema easier to access. ps_helper and ps_tools are a great start to what I am sure will be an extensive library of useful diagnostic queries and tools.